You have been commissioned the most important task of binding some valuable documents. So when you are given that task, you might be considering which binding style would be right for you. Whether you are given the task of binding a 50 page document or a 300 page document, going for the right binding style is crucial. Right style would ensure the longevity of the document. This kind of binding is very flexible as it offers numerous options to the users. The binds which can be made from plastic coils can be available in different color choices. At the same time, the diameter for plastic coil binders may vary. Depending on one’s need one can choose the plastic bindings for the documents or other important paper. Nowadays, many binding machine comes with pre-set measurements in them. However, many machines which don’t come with measurements can easily be estimated manually. In case the machines don’t offer measurements for the binding task, it becomes very daunting for the person. One might find it hard to determine the right coil binding size. Only when one knows the size of the document that needs to bind, selecting the right coil would become easier. Are you searching for the different kinds of binding coil size? Based on the number of sheets that one would want to attach, the coils should be chosen. This kind of plastic binding coils can hold up to 30-40 sheets. When one is presenting a proposal to client, having less than 30 sheets, this binding is ideal. It can provide a professional look. This kind of coil binding is ideal for creating employee handbooks. This form of plastic coil bind is popular as it can hold up to 60 sheets. When you are planning to design a small dictionary or guide book, using this binding format would be more suitable. This format would hold 70-80 sheets at the most. 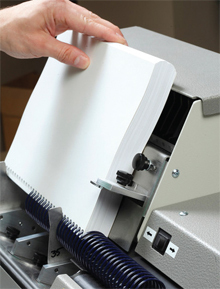 This coil binding format is best known for binding 90-100 sheets. This binding can go well with any odd size of sheets, not just only an A4 size sheet. Whether you are going to mail your documents to somewhere else or just simply hand over the document folder, make sure to go with this binding style. The coils used are environment friendly and recyclable. Customers before selecting their required size of plastic coil binding should go through the size guide. Going for a small binding won’t make the documents durable. Similarly, large binding coil size would make the document look weird. Right plastic binding which would be easily operated should be used for making the document or paper look presentable.